All items shown below have been made entirely in our workshops in Chichester. Most pieces are a one-off, designed and made as a unique piece of bespoke jewellery. They show the high quality of work and the myriad of designs and styles that we are able to produce. 18ct yellow gold and platinum panther cufflinks. Each collar is set with ten 0.7mm diamonds and each diamond has 57 facets! Incredible precision on something so small. Made in Chichester, England. Bespoke 18ct white gold and diamond feather bangle. Made in Chichester, England. 4 Claw set oval Peridot dress ring with Rose Gold foliate design shoulders set with 3 round rub over Diamonds. Rose Gold Foliate design full band set with brilliant round Diamonds. Made in Chichester, England. 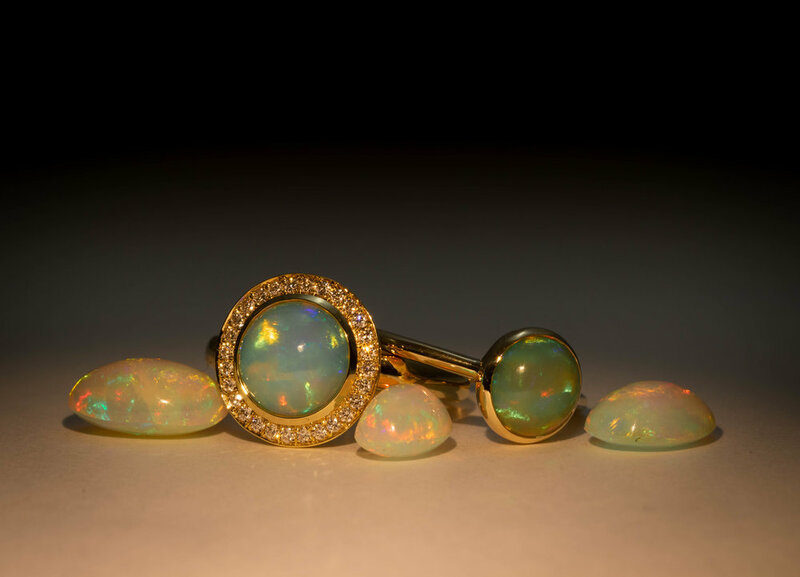 A selection of Opals from our stone stock alongside an Opal Halo cluster and rub over set Opal solitaire set in Yellow Gold. Made in Chichester, England. Two pendants made for a City Consorts and Charted Accountants Livery Company member. 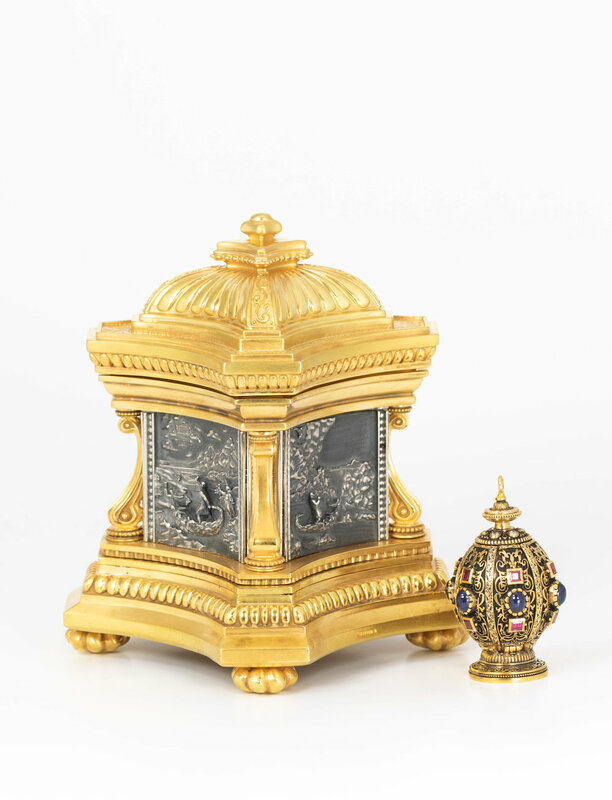 Gold pomander set with rubies, sapphires and diamonds together with a silver and silver gilt “Journey of Life casket”. Both made in Chichester, England. The pomander in the open position. Each hinged segment with a sliding cover. The pomander with the Journey of Life box in the background. The pomander in the closed position showing the square cut rubies, cabouchon sapphires and almost visible, the diamond set top. Video: Making a Masterpiece - A diamond, ruby and sapphire set gold pomander. A bespoke commission, alternating Diamond and Emerald rub over set bracelet with feature Emerald and Diamond floral cluster set equal distance apart. Made in Chichester, England. Princess cut Emerald and Diamond 3 stone engagement ring. Made in Chichester, England. 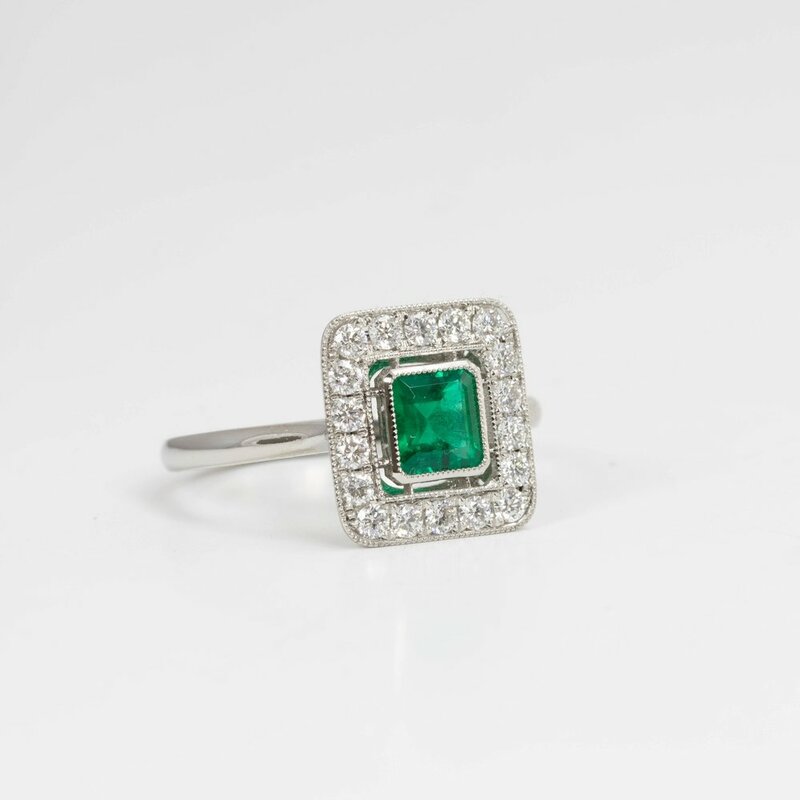 Copy of Pretty emerald and diamond set square cluster ring. Made in Chichester England. 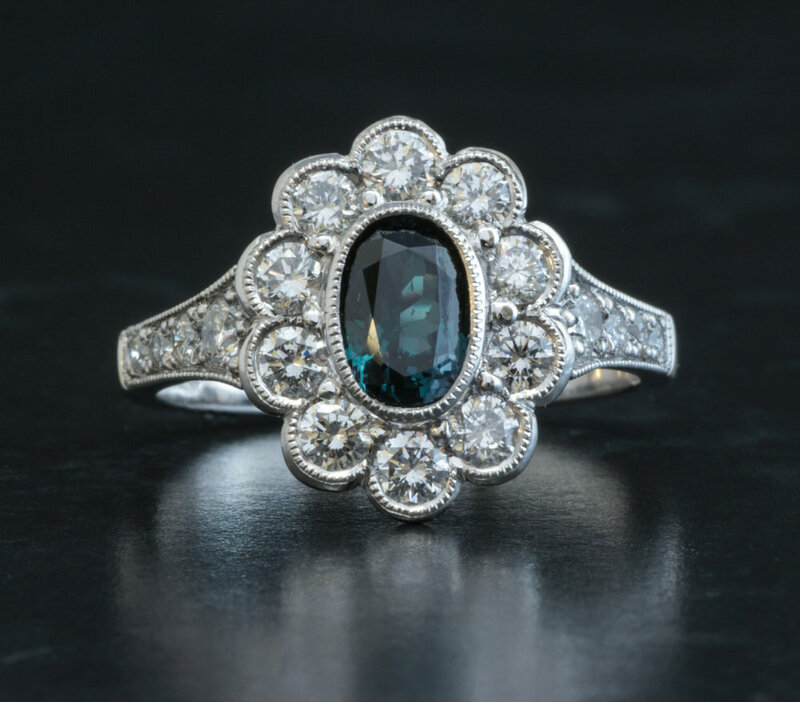 Copy of Black opal and diamond Edwardian style oval cluster ring. Made in Chichester, England. Copy of Green tourmaline and diamond wide band ring. Made in Chichester, England. Copy of Large deep purple amethyst set cocktail ring. Made in Chichester, England. Copy of Diamond and alexandrite set oval cluster ring. Made in Chichester, England. 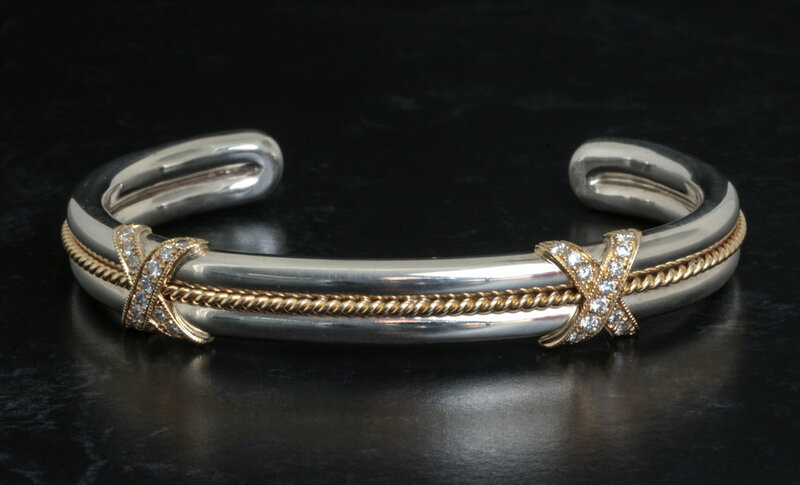 Copy of Silver and gold twist torque bangle with diamond set kiss decoration. Made in Chichester, England. Copy of White, brown and treated green diamond 3 stone ring with foliate diamond set band. Made in Chichester, England. Copy of Green/blue aquamarine (Beryl) and diamond ring. Made in Chichester, England. Copy of Gold foliate multi gem and diamond set panel bracelet. made in Chichester, England. Copy of Aquamarine and diamond Art Deco style earrings. Made in Chichester, England. Yellow gold slave bangle with raised forget me not sections alternating with high polished sections. Made in Chichester, England. 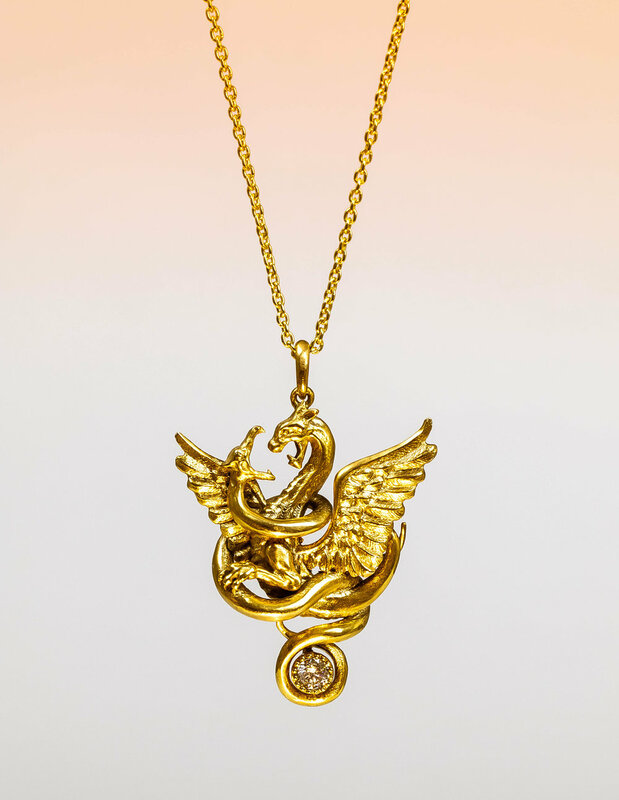 In-house design based on late C19th style depicting a serpent and dragon fighting. Brilliant cut round diamond at base. Sculpted and made in Chichester, England. 18ct white gold mounted green tourmaline, yellow sapphire and aquamarine set rings. All made in Chichester, England. Sterling silver fish necklace. Bespoke work for a local fisherman. Made in Chichester, England. 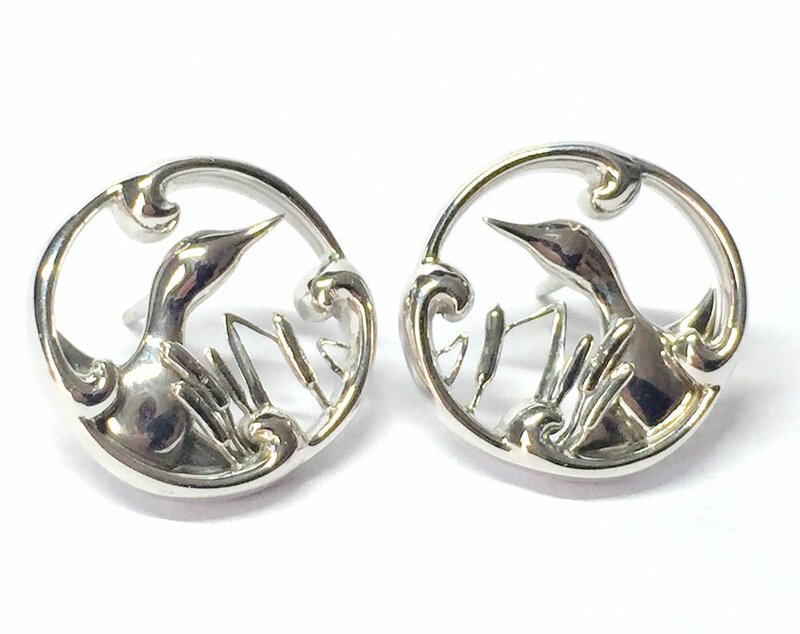 Bespoke white gold duck earrings. Made in Chichester, England. Bespoke white gold “ducks in love’ pendant. Made in Chichester, England.